A Bauhaus education for the 21st century? We are familiar with the clean functional lines of the influential modernist Bauhaus school of design founded in Weimar, Germany by Walter Gropius in 1919. The Bauhaus school was more than a training ground for designers, it was based on a set of values which influenced their whole approach including the educational philosophy underpinning their programmes. The New Vision (1938) by the experimental Hungarian photographer Laszlo Moholy-Nagy summarises the educational vision of the Bauhaus school. Although it was aimed at students of art and design, it has a wider relevance which has stood the test of time. We can still learn lessons from the Bauhaus about the place of knowledge, skill and utility within a broad general education for all. Moholy-Nagy’s aim in writing The New Vision was to stimulate all those interested in art, research, design and education and promote the integration of theory and practice. Bauhaus education places the human at the heart of the curriculum and starts from the idea that everyone is talented. It requires actual life examples of strong-minded people leading others onward, the integration of intellectual achievements in politics, science, art, technology and all the realms of human activity and the existence of centres of practical education. “the machine cannot be used as a short cut to escape the necessity for organic experience” (Lewis Mumford). Bauhaus education recognises that education, design and production are all part of an economic structure. It is not opposed to technical progress, but adopts it. Technology should never be the goal, only the means; to be exploited for the benefit of all. Each of us has to “crystallize our place as a productive unit in the community of mankind”. One of the objectives of Bauhaus education is “to keep alive in adults the child’s sincerity of emotion, truth of observation, fantasy and creativity.” Rather than adopt a rigid teaching system, learning at the Bauhaus emerged from teachers and students working in close collaboration, exploring new ways of working with materials, tools and machines to respond to challenges. 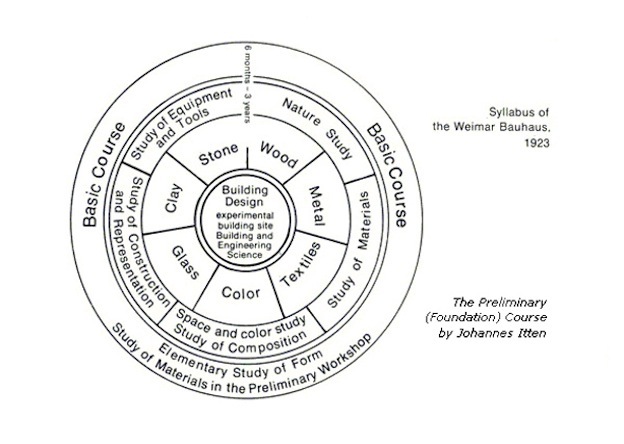 If this sounds hopelessly ‘progressive’, it is worth bearing in mind that the Bauhaus courses emphasised the systematic acquisition of knowledge and skill starting from the basic elements; the “ABC of expression”. This was always done in a way that integrated intellect and emotion rather than through the learning of unrelated facts. The workshop training took students through the properties and techniques necessary to work with all materials (wood, metal, textiles, clay, glass, stone, plastics etc.) and the use of colour, light, surface, space, volume and display. Function is defined broadly, not as a pure mechanical service but in terms of its psychological, social, historical and economic components. The broad, democratic conception of what it means to be human. The belief in the educability of everyone. The emphasis on function and usefulness in their broadest sense. The integration of theory and practice rather than their separation. The nurturing of human creativity as it emerges from an informed and skilled starting point. The benefits of an interdisciplinarity which is based on solid disciplinary foundations. All but one of the quotations are from The New Vision and come from Oliver Tomas’s excellent blog which seems to be currently unavailable. This entry was posted in Culture, Education and tagged Art, Bauhaus, culture, curriculum, Design, Education, Germany, Laszlo Moholy-Nagy, liberal education, Walter Gropius. Bookmark the permalink.